This week I want to unravel the mystery in the usage of three different Italian verbs which have a similar translation into English, and because of this are, sometimes, tricky to use. 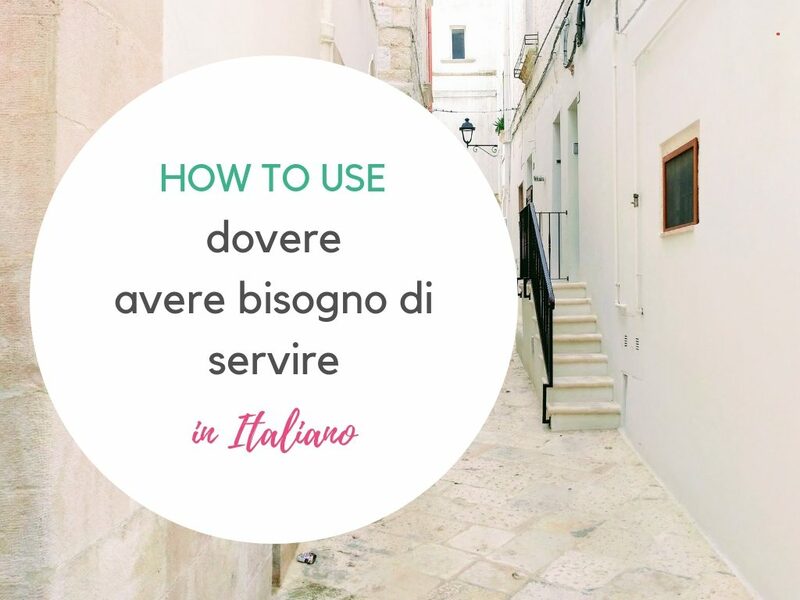 I am talking about the verbs dovere – avere bisogno di – servire. They all express a need. Nevertheless, they can’t be used indifferently to say in Italian I need or I must. Hence, you need to know when it is correct to use one or another. What is the difference between dovere, avere bisogno and servire? Dovere is a verb with different meanings. When you must, need or have to do something, you should opt for the verb dovere. An infinite (non-conjugated) verb always follows dovere in this instance. You can use dovere when in English you would you “I am supposed to”. Use dovere in the imperfect tense when you want to express that something was supposed to happen but didn’t for whatever reason. How do you know when dovere implies an obligation or a responsibility? Well, it depends on the voice intonation. Devo andare means both I must go, and I am supposed to go. Thus, pay attention to the intonation and gestures. No need to say I have listened to this verb misused countless times. Why so? One is driven to think that avere bisogno dicorresponds to the English to need. It is…and it is not. When can you use avere bisogno di instead dovere? Hai bisogno di me? – Do you need me? And, it is not over, as wordy as they are, Italians have another way to express a need which implies the verb servire. The use of servire does not vary from the one of avere bisogno di. As you might have noticed, the verb, servire follows the same pattern as the impersonal verb piacere. Servire is conjugated just in the third person singular or plural and it is preceded by an indirect object pronoun. Vi serve… ? / vi servono…? I need to go → devo andare – it’s is CORRECT! I need to go → ho bisogno di andare – it’s WRONG! Another common verb expressing a need or an obligation for some action to be performed is the strictly impersonal verb bisogna. Bisogna exists just in simple tenses (simple future, simple conditional, etc..) and is used only in the third person singular. An infinite verb always follows it when the subject is not identified.